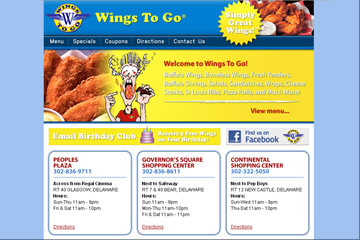 MORE ABOUT Wings to Go: Since 1985, Wings To Go is a name synonymous with Award Winning Authentic Buffalo-Style Chicken Wings and Buffalo Wing Sauces. Offering 19 different mouth watering flavors to tantalize your taste buds! As people like to say in this business we started out on a wing and a prayer. Well really we started out with some wings in the hopes of answering the prayers of homesick Buffalonians stationed at Dover Air Force Base in Delaware. In the summer of 1985, the first Wings To Go opened opposite Dover Air Force Base. To our surprise and excitement we pulled our greatest crowd from the nearby beach. By 1989 we began franchising and the rest is history. There are now over 80 locations spanning the United States from coast to coast. Our Featured Items Include: Boneless Wings, Traditional Wings, Buffalo Shrimp, St. Louis Ribs, Fresh Tenders, Cheese Steaks, Salads, Sandwiches, Wraps, Hot Dogs, Pizza Rolls, Fried Cheese Cake and Our World Famous Sauces!